Welcome to Boozinette. 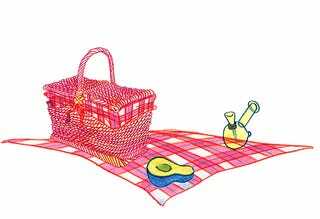 This is the Picnic Blanket. In a small saucepan, bring all ingredients to a boil. Lower heat to a simmer for 15 minutes. Strain, contain, let cool and refrigerate. Use to berry any bitter flavor or feelings of ill will towards Barry. 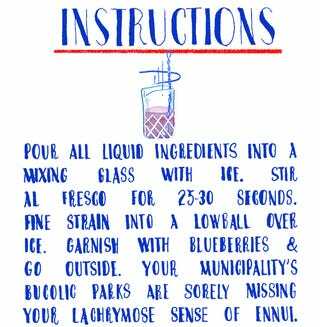 Pour all liquid ingredients into a mixing glass with ice. Stir al fresco for 25-30 seconds. Fine strain into a lowball over ice. Garnish with blueberries and go outside. Your municipality’s bucolic parks are sorely missing your lachrymose sense of ennui.